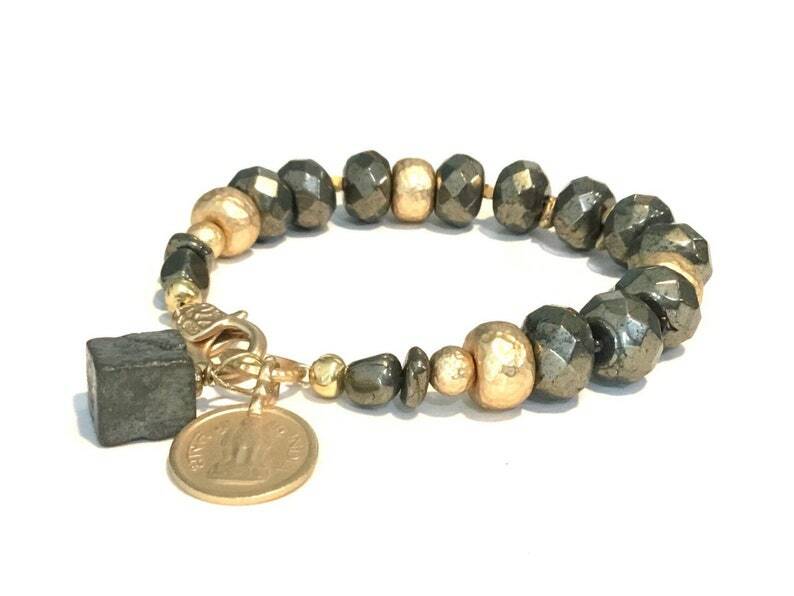 This pyrite bead bracelet is classic with a cool boho twist. And sometimes you just want one incredibly cool bracelet to stack with that gold bangle you already have to freshen up your look. This bracelet does just that! It’s perfect with black or grey to spice up your outfit, even an lbd on a night out! I used beautiful charcoal faceted Czech glass chunky rondelles along with polished pyrite irregular shaped beads as the base of this bracelet. Giving this bracelet sparkle are matte gold plated hammered donut beads, which are the perfect accent to the iridescence of the pyrite. Hanging from the embossed matte gold lobster class are the stars of this piece- a vintage coin that has been beautifully plated and a raw pyrite cube. Comes beautifully wrapped and ready to gift! 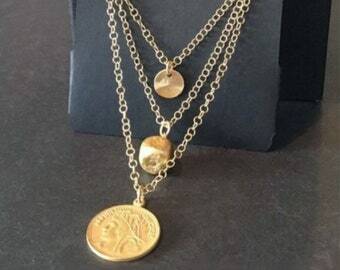 Note: This bracelet is crafted with an actual vintage coin that has been beautifully plated in 22k gold. Due to the natural aging of vintage coins, it may have minor imperfections —small nicks or irregularities— consistent with its age. Just use a measuring tape or a piece of string and wrap it around your wrist where you want to wear your bracelet. Snug but not too tight. If you're using string, mark it and measure next to a ruler. Then select your wrist size at checkout.